In the Napa Valley Unified School District, it is the goal to have ALL students college and career ready. Closing the achievement gap is imperative in NVUSD; their student population is 54% Hispanic or Latino. To accomplish this goal NVUSD not only implements the CCSS, but they also implement 21st century skills known as the 4 C’s (Critical Thinking, Creativity, Collaboration, Communication) in every classroom. It is expected that all students learn how to think critically and creatively as well as collaborate and communicate with their peers. In order for a student to even attempt one of these skills, it is necessary for the student to feel that their classroom is a safe place to express thoughts, ideas, and make mistakes. When students learn how to collaborate and feel safe to do so, their participation in class increases along with motivation to learn. The following graph is from the Public Policy Institute of California. It shows how with the new Smarter Balanced test only highlights the increased achievement gap for economically disadvantanged and English Learner student statewide. The scores are compared to the California Standardized Test (CST) which was used prior to Smarter Balanced. The graph below illustrates this data by counties and breaks it down by ethnicity. 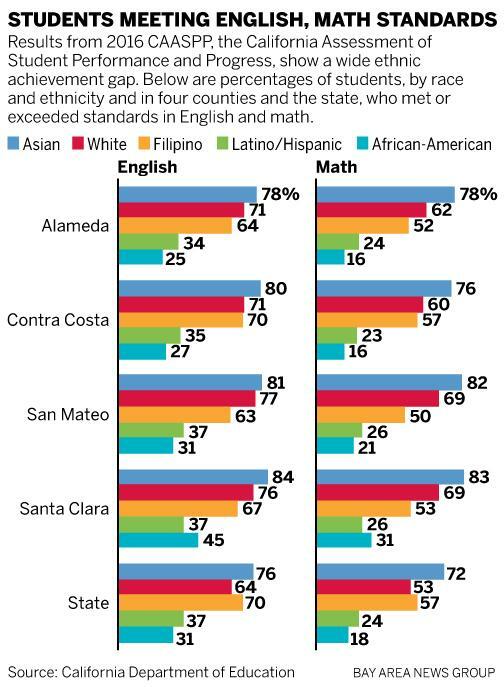 As you can see there is disparity how African American and Latino students perform compare to White, Filipino and Asian students. ​Napa Valley Unified School District believes that in addition to the basic traditional education imperatives, it is crucial that their students master the 21st century skills known as the four C’s: critical thinking, effective communication, collaboration on teams, and expanding upon students’ natural creativity. They aim to be committed to creating powerful learning opportunities to ensure that we succeed. ​“the brain does not naturally separate emotions from cognition, either anatomically or perceptually” (Caine & Caine, 1994). When we develop one-on-one relationship skills – becoming aware of and tending to the emotional needs of students – we enter the realm of learning as well. If learning in school meets students’ emotional needs, they will more likely engage in the learning. School becomes a motivating place to be (Rogers, Ludington, & Graham, 1998). Students are motivated when they believe that teachers treat them like people and care about them personally and educationally. When teachers apply in the classroom their knowledge of human needs, amazing things happen.